ARCHOS FAQ - How do I turn my device into a wifi hotspot for other devices using my 3G/4G connection? You can turn your device into a wifi hotspot to connect your laptop or another device via WiFi. Make sure your 3G/4G is activated and correctly configured. 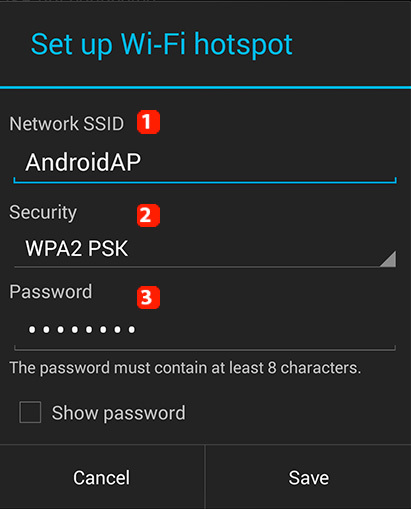 As a first step, tick the box WiFi hotspot. An icon will be then displayed in the notifications bar. Then go in the option Set up WiFi hotspot to setup access to your new modem. 1. SSID : name of your modem which will be visible for the devices that will try to connect to your device. 2. Security: determines the type of password encryption. The most secure type is WPA2.